But this morning when we got up it was sunny! 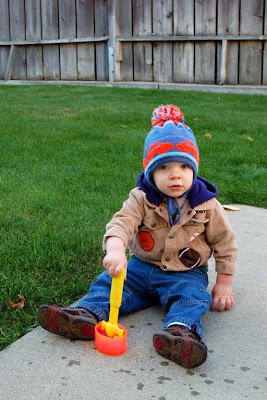 So right after breakfast we bundled up and went outside. The wind was whipping so the bubbles went everywhere. And of course he loved it! I know how to dip for bubbles myself, Mom! I love how this one turned out with my slower shutter speed! 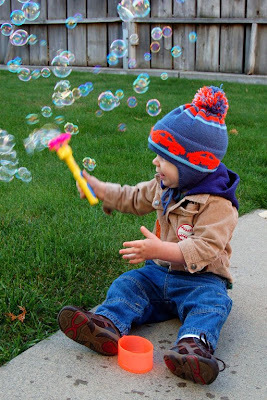 He was waving the wand all around and just surrounded by bubbles! I can see why you wouldn't want to do that inside - it looks like a ton of bubbles! Yup I wouldn't do bubbles inside too! Big big mess! He looks like he was having fun. Nice shots too! 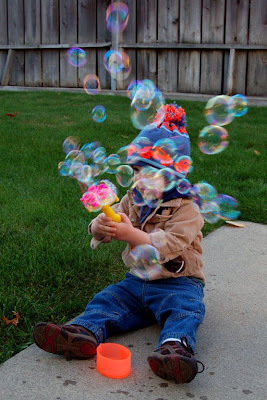 Wow that bubble blower is awesome. Neat pictures! 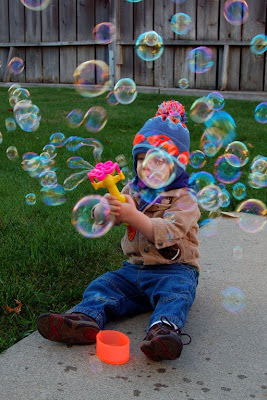 He looks VERY happy with his bubble blower. You found some bubbles? I have been looking, but cannot find them anywhere! Those shots of the bubbles swirling around his head are terrific.